It was hot, hot, hot in New York City for spring/summer 2017's fashion week—and the runway clothes mirrored it: cool crop tops, dramatically billowing dresses and loose-fit tailoring provided the DNA for the kind of easy-breezy pieces designers have turned their attention to for next summer. 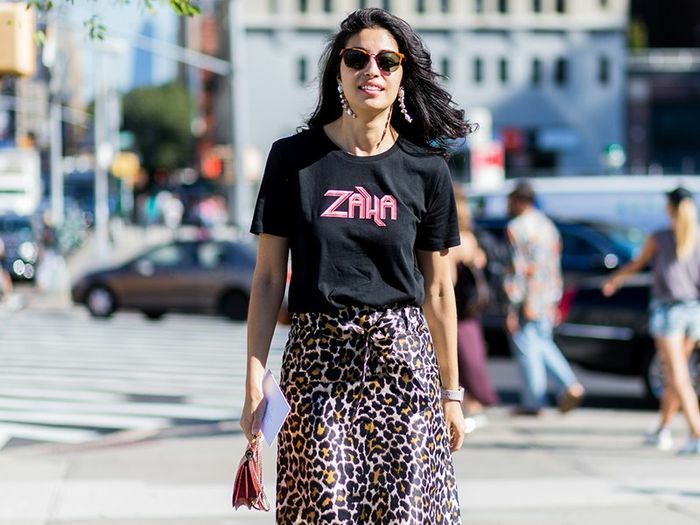 So scorching have these September fashion weeks become over the pond, it's no wonder that time and again the most trusted trends are used as fashion's coping mechanisms. Why fix what isn't broken? Why suffer in the heat? The createurs are reinventing, revitalising and reworking them to perfection; this method keeps us coming back for more, but also allows us to wear last summer's big purchase without feeling dated. It would've been all too easy for those with strong connections to swipe the new looks straight from the runway, ditch their existing clothes, and head out into the sun-drenched sidewalks of The Big Apple. But good news for those of you who don't have the Proenza Schouler boys on speed dial—plenty of the topline trends are sitting in your wardrobe. We just know it. Go through the gallery to see New York's top looks you already have nailed. Stripes, and stripes, and stripes! 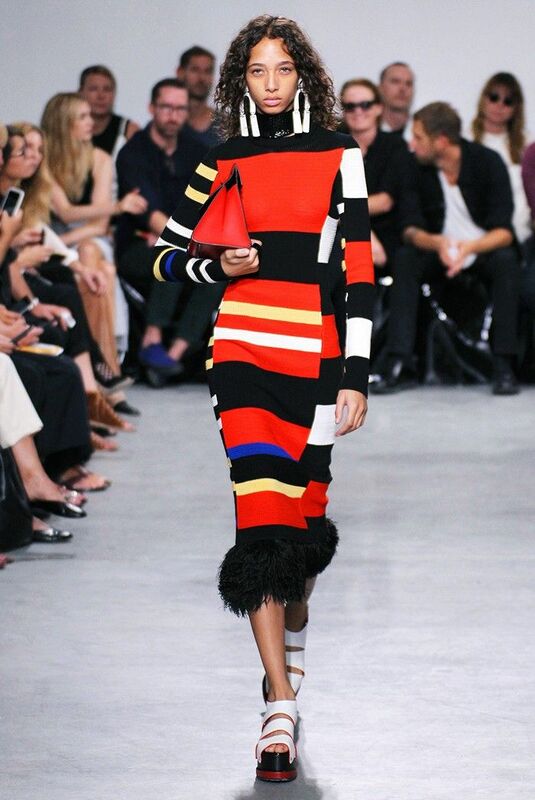 Style Notes: Whether colour-blocked and ultra vibrant, like Proenza Schouler's knitted dresses (along with the matching graphic earrings and banded shoes pictured here), or subtle like J.Crew's warped blue shirting, the NYFW runways were marked with strong lines of every kind. You can even focus on striped accessories, like the sweet handbags at Tory Burch. Now, pull out your old Bretons, stat. Style Notes: We've all got bras, right? Difference is, you may not be making yours a visible part of each and every ensemble at the moment. Altuzarra's cheeky cherry-printed bralettes were worn in a surprisingly sophisticated way under blazers (pictured here); Alexander Wang took a sportier approach to silk lingerie; and Phillip Lim's girls opted for skimpy numbers, also under suiting. The memo is this: Forgo your tops, reveal your underpinnings and add a jacket. Style Notes: Ditsy, bohemian, splashy, romantic, graphic, bright, subtle… You name it, there's a floral dress to match from New York's finest designers. Stuart Vevers took a grunge approach at Coach, pairing his dark blooms with goth-girl boots; Victoria Beckham created flower prints that spread across frocks and onto matching handbags; and Tibi created a smock dress that we're dying to get our hands onto already. Hurry up, spring/summer 2017! Want to fill in a few wardrobe gaps, fast? We've chosen some high-street pieces that tick off these trends now—keep going through the gallery. The ultimate summer-to-winter colour combination. This designer is famed for her little layering bras. Smart enough for work, we think. The pull-cord makes this pretty dress more punchy. This is your Friday night party top, done. Colour-block around the clock—this piece works day and night. If new trends are your thing, then don't go anywhere without checking out our A/W 16 shopping list.